Other Products by Giant Sports. Search other Protein Powder products. 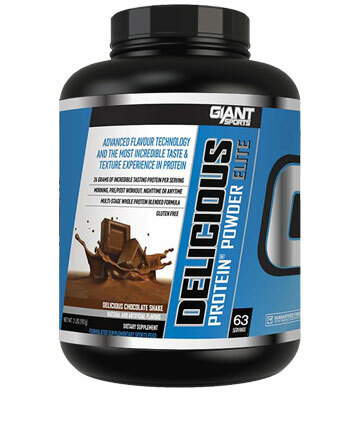 Giant Sports Delicious Protein is destined to become the new standard for taste and texture in protein powders. The pinnacle of protein powders - Giant Sports Delicious Protein combines an outstandingly useful protein supplement with the most incredibly rich, delicious and satisfying taste in the history of protein powders. Delicious Protein delivers a 6-stage blended protein formula for optimised, timed nitrogen dispersion to continually feed the muscles with a steady flow of amino acids for enhanced protein synthesis and thus muscle growth. Delicious Protein not only offers a taste sensation but is a "true protein powder" with 27g of high quality protein per serve with added BCAA's to heighten muscle development and optimise recovery time. Delicious Protein is further enhanced with Giant Pro Enzyme Complex for greater digestion, absorption and utilisation. Delicious Protein defines "Deliciosity" - the joyful discovery of unexpected deliciousness in a product category not known for such! Mix 1 level scoop (36g) with 6-8 oz. cold water or skim milk and shake. Consume immediately. Consume as a protein supplement immediately following exercise to support lean muscle and promote recovery time from exercise. Use any time during the day as a convenient and delicious way to supplement your protein needs in the morning, afternoon or in the evening. The protein and fibre in Delicious Protein help satisfy hunger and support feelings of fullness. Provide a sustained release of amino acids into the bloodstream; Maintain positive nitrogen balance; Increase lean muscle mass; Increase strength; Increase muscle fullness; Prevent muscle catabolism; Improve recovery time. Bodybuilders; Weight & resistance trainers; Crossfit; Martial Arts; Team Sports (e.g. AFL, Rugby, Soccer, basketball, netball); Endurance sports; Fitness & figure; Weight management; Any athlete or sports person wishing to improve lean muscle mass improve recovery time. The flavour isn't too bad, but what I don't like about this is the consistency. It has a very gluggy/thick consistency and is hard to mix up. It is similar to the ON casein in the way that it doesn't matter if you use (water or milk), it will come out a very thick and almost gluggy every time. And cause you to fill up quick so your not as hungry for your "real" meals. My favourite whey is ON 100% gold standard, strawberry flavour. Myself and all the trainers at our gym use it and also give it to our clients after PT sessions. All the reviews saying its too gluggy then maybe use more water or stick to the serving sizes as suggested. 1 scoop to 300mls cold water works perfect. I add it to my smoothie in the morning and it hits the spot!! I recommend it to anyone! delicious, right consistency for me. INGREDIENTS: Giant Delicious Protein Blend (Whey Protein Concentrate, Milk Protein Isolate, Micellar Casein, Whey Protein Isolate), Non-Dairy Creamer (Hydrogenated Coconut Oil, Corn Syrup Solids, Sodium Caseinate, Mono and Diglycerides, Dipotassium Phosphate, Sodium Silicoaluminate, Soy Lecithin), Gum Blend (Xanthan, Celluloase, Carrageenan), Natural and Artificial Flavours, Lactase Enzyme, Salt, Sucralose, Acesulfame Potassium.